We are engaged in manufacturing and supplying an enormous range of Store Container that is manufactured by our experts at par with the set quality standards. 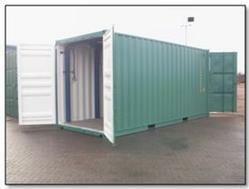 Furthermore, our product range also comprises Aluminum Lined Container, Office Container and Cabin. These products are precisely fabricated using the best quality raw material and latest technology with high precision as per the set industrial quality standards. Clients can avail these products from us at market leading prices. Tunnel container storage containers come with doors on both ends of the container. They are very useful when quick loading and unloading of materials is required. Double doors make it easy for loading and unloading of the freight. Construction of this sort of shipping containers is typically made of steel and iron. They are available in standardized sizes of 40ft and 20ft.